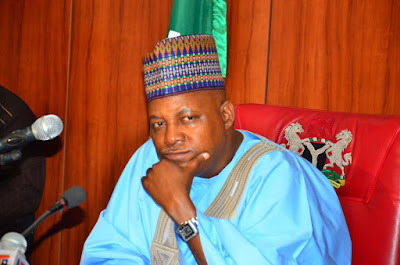 Angered by the arrest of some officials allegedly ‎involved in the diversion of 50 bags of rice meant for internally displaced persons, Borno State Governor, Kashim Shettima has asked the Borno State Commissioner of Police to expedite action in the prosecution of anyone arrested with a view to having anyone found guilty, sentenced to jail by the law court. Shettima's directive was made public by his spokesman, Malam Isa Gusau in a statement emailed to journalists on Wednesday. The Governor’s directive follows report that hundreds of Internally Displaced Persons (IDPs) on Tuesday morning arrested an official of the Borno State Emergency Management Agency (SEMA) over alleged theft of food items meant for displaced persons at the Bakassi IDP camp, which is an estate of 400 units of two bedrooms built by Governor Shettima's administration in Maiduguri in which IDP's from 7 local government areas have been living since 2014. Four officials were said to have been arrested by the police after IDP'S held them. Governor Shettima was very bitter about the development and has vowed to ensure anyone found wanting amongst those arrested in sentenced to years in prison, Gusau said. The spokesman noted that the food item in question was part of those bought by the Borno State Government for feeding of IDP'S in the month of December, maintaining that the Borno State Government and the World Food Programme is so far feeding IDP's since the beginning of December, 2016, pending supplies from NEMA. "Governor Shettima approved funds for the food stuff at the IDP camp and he is deeply pained by this development. The Governor regards any attempt to divert food meant for IDP’S as a crime against humanity which must not go unpunished. The Governor has promptly asked the Commissioner of Police in Borno State to expedite action that should ensure the prosecution of anyone arrested whether officials or anybody at all, in order to secure conviction by the court. The Governor has told the Commissioner of Police not to entertain any plea from any quarter at all. The Governor wwould like the court sentence, if secured at the court, to serve as warning to whoever might be engaged in shortchanging citizens who live in trauma having lost their loved ones, means of livelihood and their homes as a result of violent attacks by insurgents. The Governor assures internally displaced persons that his administration will continue to take measures that would enhance their welfare. As part of these measures, the Bakassi IDP camp where the incident was said to have occurred, has between 3 to 4 Divisional Police Officers of the respective local government areas living at the camp. The idea of having D.P.O's and policemen living at IDP camps was part of measures introduced by Governor Shettima since 2014 in order to maximize security of lives and property as well as the protection of human rights across all IDP camps and other parts of Borno State" the statement said. ‎The media reported that one official in collaboration with three Internally Displaced Persons were intercepted while allegedly loading fifty bags of 50 kilogram sacks of rice into an waiting truck.